The lone fisherman came into port in Skarsvåg, North Cape with his pirate flag hoisted. On deck, the two meter King Crabs were still trying to crawl out of their slippery case. As the catch is hoisted to the pier of the fishing cannery, it is important to keep it alive. All of them: One for all, all for one. To keep it alive has been important not only for these crabs. The species has its natural habitat in the northern part of the Pacific Rim. The beasty tasty meaty “Kamchatky” crab was seafood to the Russian, Korean and Japanese amongst others. It tastes like lobster. And it is much bigger than the lobster. The longest legs can be almost 1 m.
It used to only walk the bed of the Sea of Okhotsk, Sea of Japan / East Sea, and the Bering Sea as far south as British Colombia in Canada. In 1980/81 the U.S. King Crab fishery hit its highest point when some 90.000 tons of king crab was brought ashore. Today the annual catch is much lower. In 1931 the Soviets attempted to transport crab larvae from Vladivostok to Murmansk and add King Crab to the Barents Sea. People were hungry, an attempt to farm Cod failed, and the King Crab could become a source of food. Several attempts failed, the scientists Yevgeny Kreps and Ivan Zaks were not able to bring the crab larvae alive across the USSR. Their failure had repercussions, both men found themselves “relocated” by Stalin and his men. After the Great Patriotic War (Russian: Вели́кая Оте́чественная война́ – Velíkaya Otéchestvennaya voyná) advanced technology and better transportation made it possible to try once again to introduce the King Crab to the northwest corner of the Soviet Union. In the 1960s, scientists led by Yuri Orlov finally succeeded to “auglocate” the King Crab to the waters of Murmansk. Once in the cold water of the Barents area, the King Crab thrived. Almost like a red army, it has marched due west. It has conquered the Varangerfjord and beyond. By 2000 the numbers of King Crabs in Norwegian quarters reach 3 million. Hence, commercial fishing could commence in 2002. Currently, the Norwegian authorities have decided to stop royal crawling west of 26 degrees East/North Cape. The Barents leg of the King Crab population is closely monitored by the Russians and Norwegians. 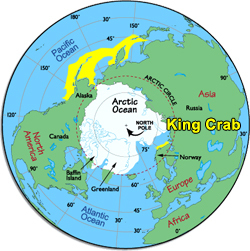 The King Crab’s effect on the ecology of the Barents Sea is disputed. Effective directives are sought to be executed by both Moscow and Oslo. In the meantime, travelers may enjoy watching, catching and munching the crunching delicious Paralithodes camtschaticus between Nordkapp and Kirkenes. Where have you experienced the King Crab?